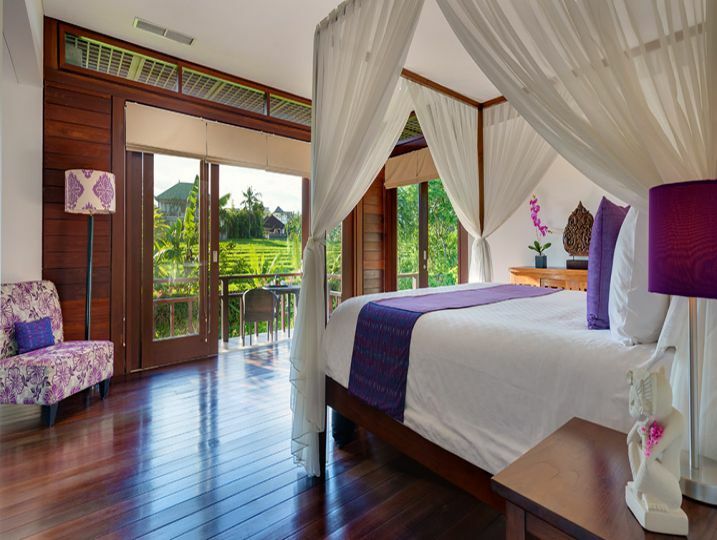 Bendega Villas comprises two contemporary styled luxuriously appointed villas and a romantic one-bedroom pavilion, which in combination sleep up to 18 guests. 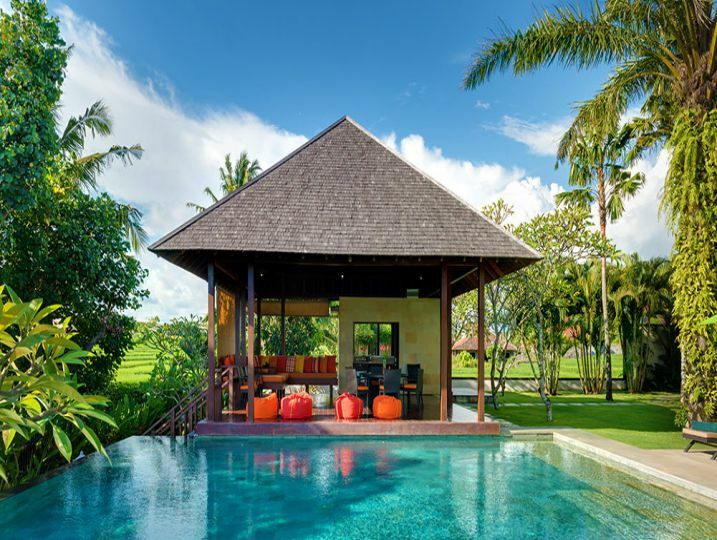 Villas are connected to each other by gateways in their private walled gardens, and can be combined to offer four-bedroom, six-bedroom or nine-bedroom villa options with up to three swimming pools. This flexible arrangement offers multiple sets of families and multigenerational groups privacy within a shared environment. 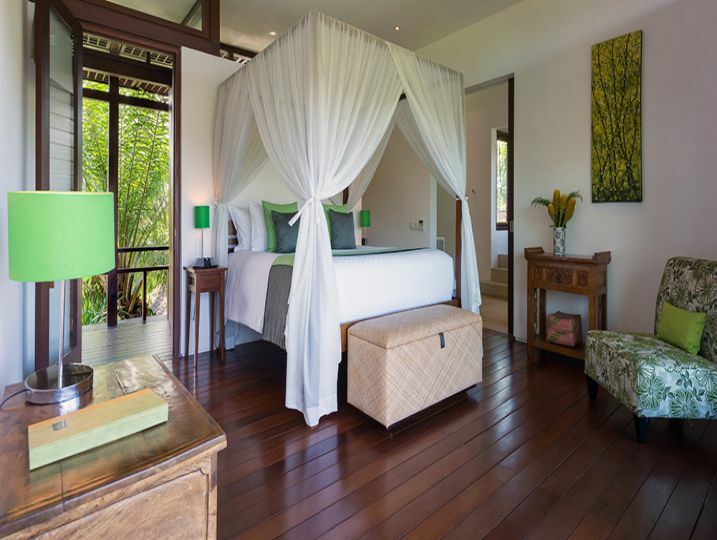 The larger of the two villas, Bendega Nui, has five bedrooms whilst Bendega Rato has three. 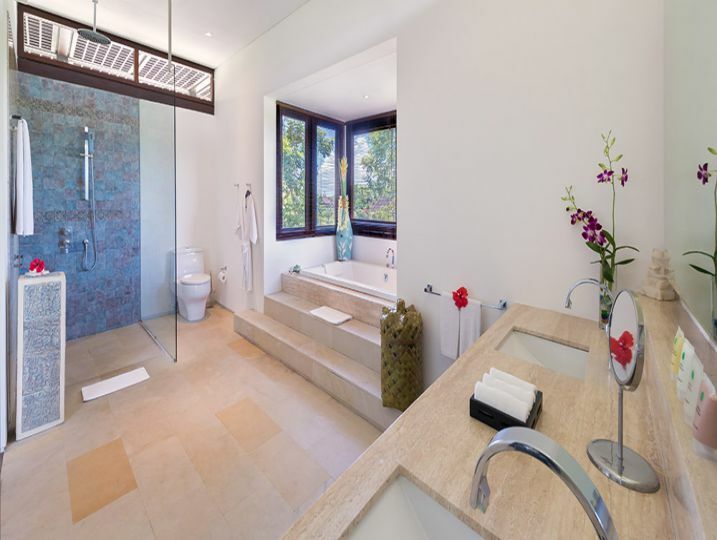 The one-bedroom pavilion, set in its own walled garden with a plunge pool, may only be booked in combination with one or both of the other villas, and suits couples or independent teens within a larger group looking for a little extra privacy. 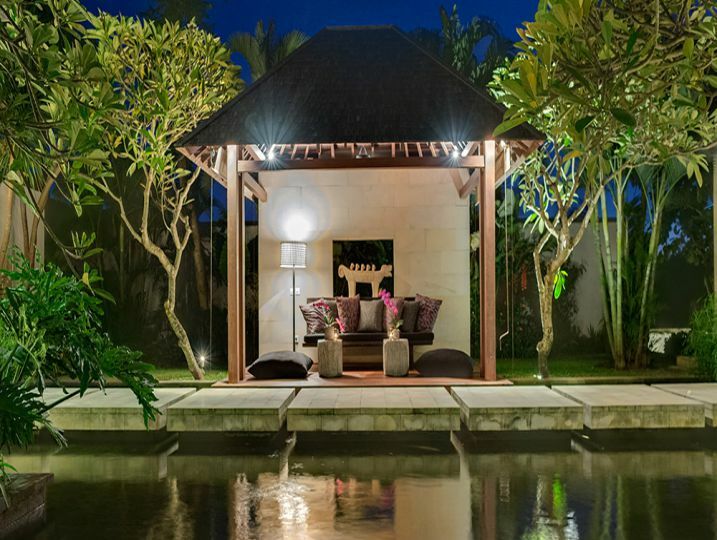 Bendega Villas seamlessly merge Balinese architecture with a clean, modern design. Each of the bedrooms is spacious, stylishly furnished and equipped with an ensuite bathroom and a balcony, terrace or private garden. 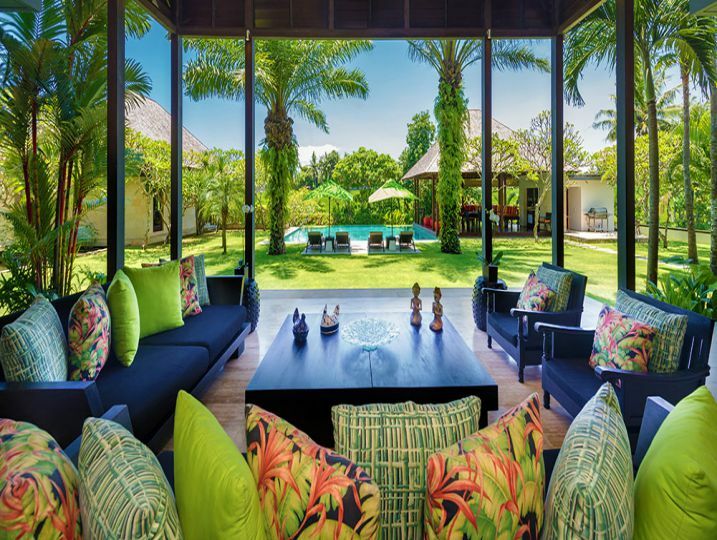 The villas feature luxurious open-plan living and dining areas, smart modern kitchens, a library or media room and games room with pool table, as well as over an acre of lush tropical gardens sprinkled with koi carp ponds, terraces and cushion-strewn balés. A 17-strong staff team, including an exceptional chef, takes care of guests around the clock, and the villa menu lists an extensive range of enticing dishes. 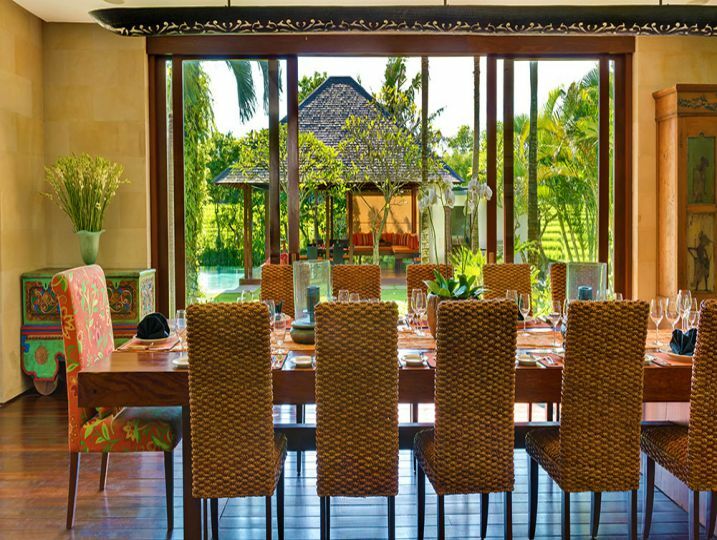 Dining out is also an appealing option since the villa’s location in Canggu presents many excellent restaurants within strolling distance, and most of these are located on Canggu’s world-famous surfing beach. 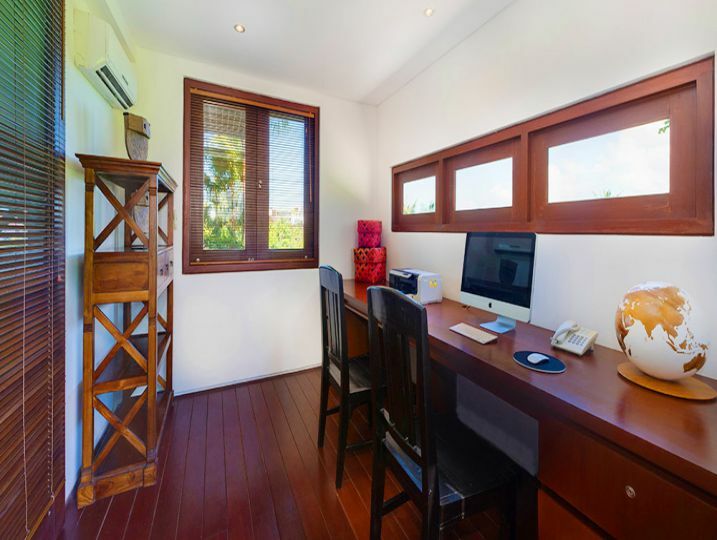 There are many more restaurants, bars, spas and boutiques to choose from in bustling Seminyak, 11km away. Click on these links to find out more about the indulgent three-bedroom Bendega Rato and five-bedroom Bendega Nui. 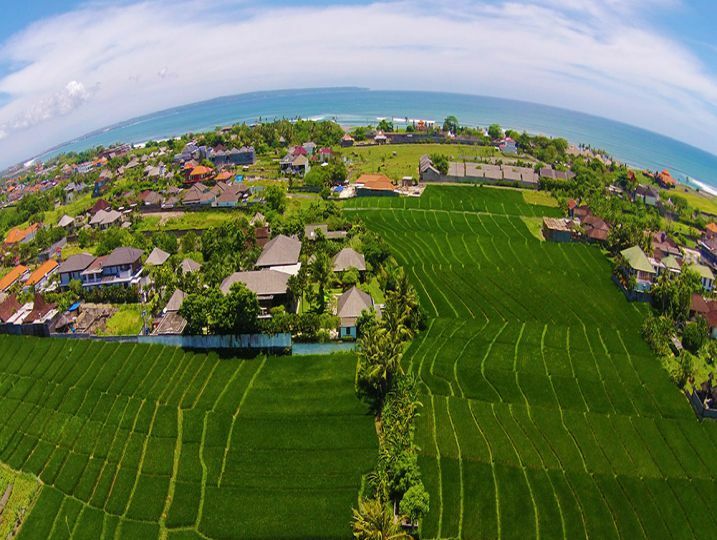 Or visit the Bendega Villas website to see how the villas can be combined to meet your holiday requirements. 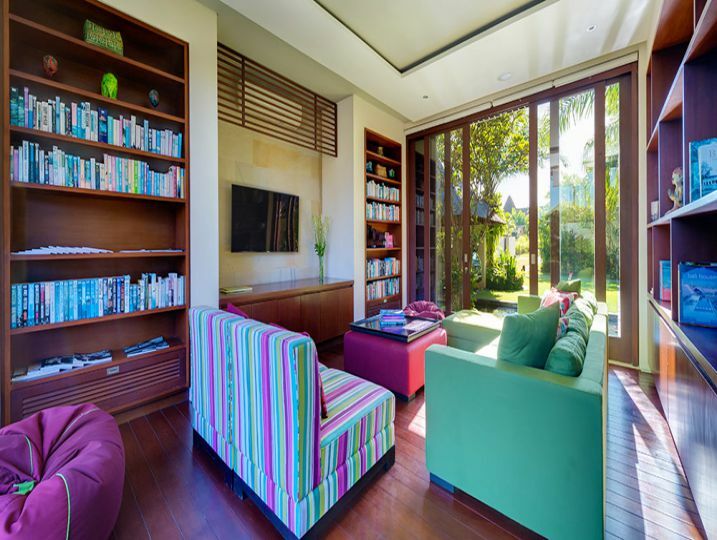 Main Living Area (Open-air living area, Television with international channels & DVD player, Music docking station). Bedroom 1(Ensuite bathroom, King size bed, Air-conditioning, Toiletries, Walk-in wardrobe). Bedroom 2(Ensuite bathroom, King size bed, Air-conditioning, Toiletries, Walk-in wardrobe). Bedroom 3(Ensuite bathroom, King size bed, Air-conditioning, Toiletries, Walk-in wardrobe). Bedroom 4(Ensuite bathroom, King size bed, Air-conditioning, Toiletries, Walk-in wardrobe). Bedroom 5(Ensuite bathroom, King size bed, Air-conditioning, Toiletries, Walk-in wardrobe). Bedroom 6(Ensuite bathroom, King size bed, Air-conditioning, Toiletries, Walk-in wardrobe). Bedroom 7(Ensuite bathroom, King size bed, Air-conditioning, Toiletries, Walk-in wardrobe). 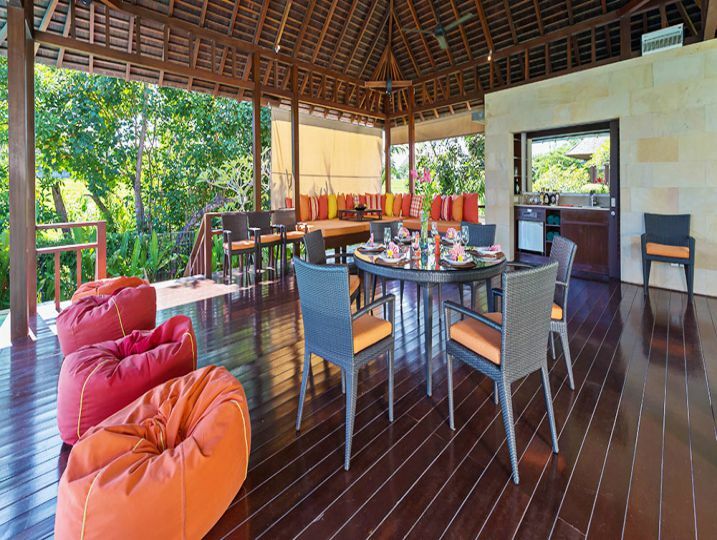 Kitchen and Dining(Open-air kitchen & dining area, Fully equipped kitchen, Cutlery, chinaware & glassware, Blender, Microwave, Full-size refrigerator, Dishwasher). Additional Living Area 1(Massage room, Lounge setting). Miscellaneous(Safety deposit box, Ipod Docking System). Services Performed by Staff(Villa Manager, Villa Supervisor, Butler, Cook, Housekeeper, Security Swimming Pool, Attendant Garden Attendant). Property Outlook (Swimming pool views, Garden view). 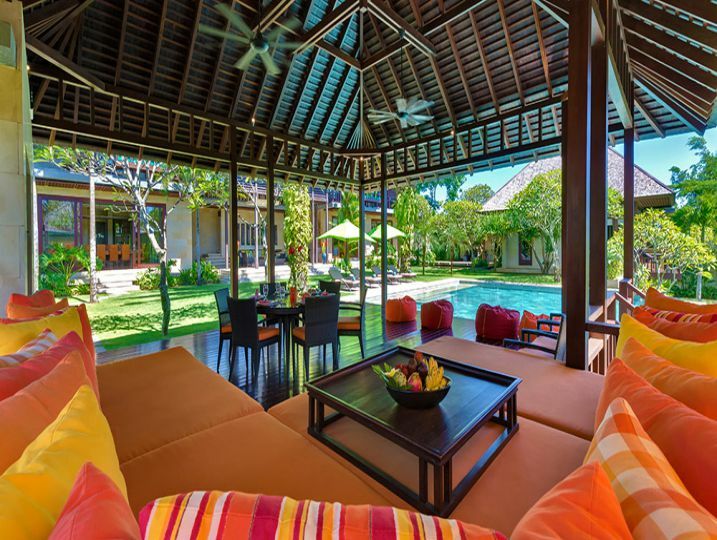 Swimming Pool Area (Private swimming pool, Poolside sunlounges). Outdoor Entertaining (Undercover outdoor entertaining area, Outdoor setting, Outdoor sofa, Outdoor setting & sofa). 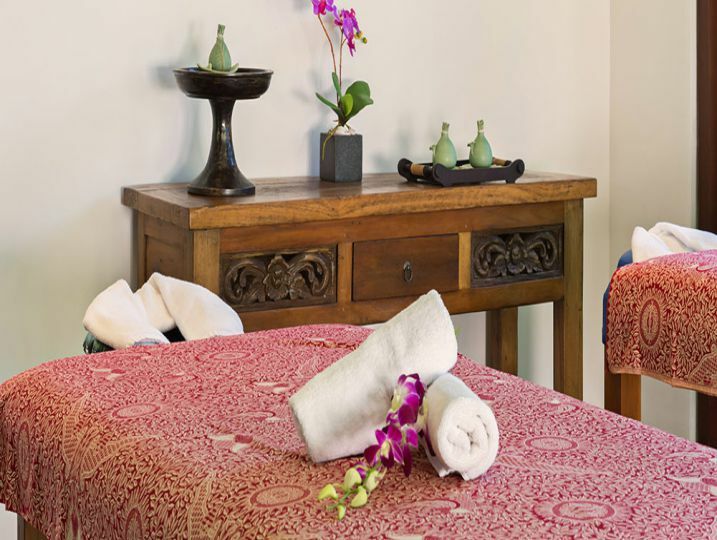 Airport pick-up on arrival, Welcome drink upon arrival, Flower arrangements in the villa upon arrival, Daily Breakfast, Free Wi-Fi, Drinking water, Coffee & tea, Housekeeping service. Bendega Complex (Nui 4BR + Rato) is available for selected dates.